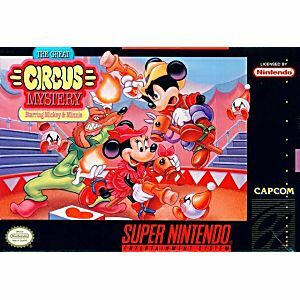 Great Circus Mystery Starring Mickey and Minnie SNES Super Nintendo Game Cartridge Cleaned Tested and Guaranteed to Work! Mickey and Minnie plan to spend a fun-filled day at the circus but to their dismay all the performers have disappeared. Some unknown force has replaced them with crazy characters who are out to make Mickey and Minnie's day an unpleasant one. And on top of that, Donald Duck and Pluto are nowhere to be seen. 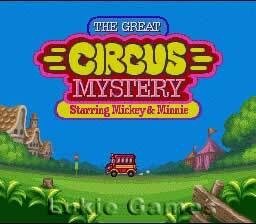 As Mickey and Minnie search for clue, the trail leads them beyond the circus. Travel along with our hero and heroine as they explore 6 hostile levels like the Haunted House, Frozen Plains and the Jungle. Use special Safari or Western outfits to fend off the enemy and climb through treacherous terrain looking for Donald and Pluto. Hopefully along the way the happenings at the circus will begin to make sense. They mailed it to me and it got here fast, I plugged it in to play and it was like the game was brand new. Cartridge looked new and everything (sound/image) was just like I remembered as a kid. Bought this game to play with my sister, we've had a fun time playing it and trying to beat it. Classic Game- Definetly Fun for all ages! 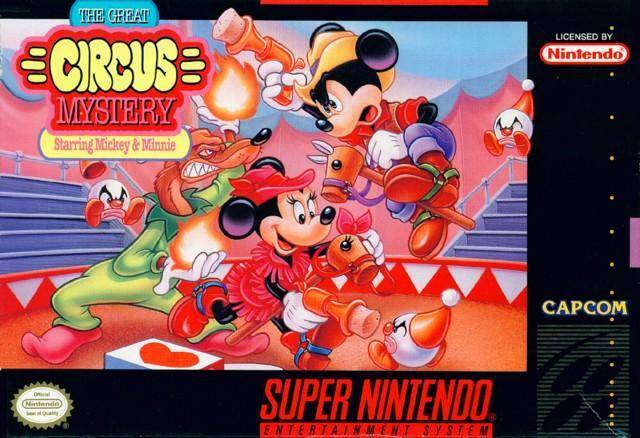 This "Great Circus Mickey and Minnie" game held so many Great memories for my oldest boy when he was little and used to play it...So when his younger brother bought it for him for his 21st B-day, he was absolutely Thrilled! The two of them played it all night long and he got just as much enjoyment (if not more) out of this game as he used to when he was little!! I played through this game so many times as a kid and it's still just as fun every time. 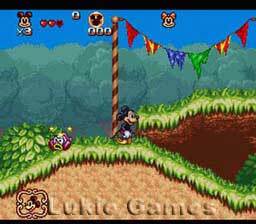 Of the Mickey games I've played this is my favorite one. An original platformer, that is worth playing more than once. The game has a quick feel to it. As you will most likely zip through the levels and the bosses. But you can’t escape the magic of the Disney characters. Something about playing as Mickey and/or Minnie just adds to the aw of the game. Also, who knew that running around as Mickey with a vacuum on was fun?